Bakhdida, Iraq: In the centre of this hardscrabble Christian town there’s a 12th-century church where visitors can peer into an underground passageway that once allowed the faithful to hide from Muslim marauders. The tunnels below have since crumbled, but the threat still looms on northern Iraq’s surrounding plains. 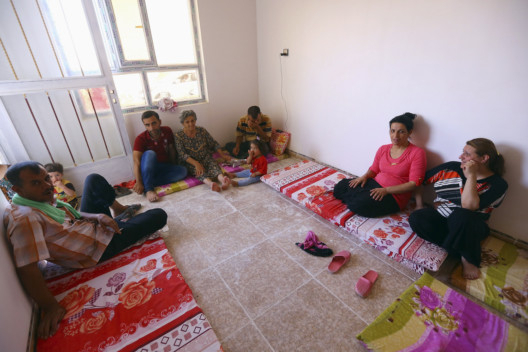 When advancing Islamic State of Iraq and the Levant (Isil) militants launched mortar attacks in late June, nearly all of Bakhdida’s 50,000 residents fled overland to Arbil, the capital of the Iraqi region of Kurdistan, for protection. Were it not for Kurdish peshmerga forces that swept in to beat back the onslaught, this historic Christian enclave, known to locals as Qaraqosh, would be deserted. In recent days, most people have come back to their homes. But dire water and fuel shortages, electrical blackouts and a lack of work are strangling returnees who must also grapple with the mental strain of living within firing range of Isil militants. 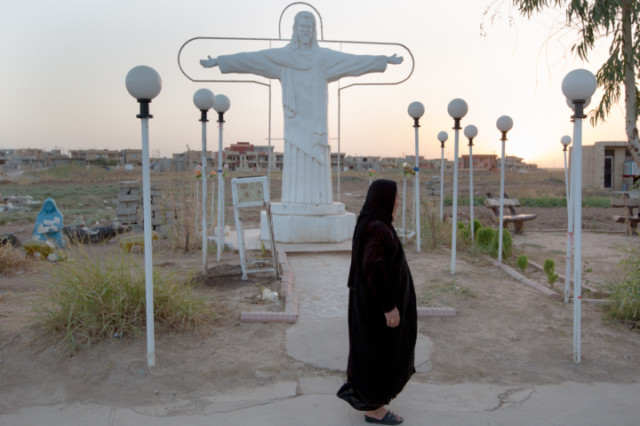 With Iraq at risk of fracturing along sectarian fault lines, local leaders fear the loss of one of the world’s oldest Christian communities and its heritage as more and more residents move to Kurdish cities and neighbouring countries. On Friday, the exodus was accelerated when Isil decreed that Christian holdouts in the city of Mosul must convert to Islam or pay a special tax — with death as a “last resort”. Iraqi Christians have endured greater persecution since the 2003 US invasion that toppled Saddam Hussain. In the sectarian conflict that followed, a surge of harassment, church bombings and other deadly attacks caused the population to shrink from 1.5 million to about 400,000. In 2008, a wave of violence targeted Christians living in Mosul, Iraq’s second largest city and an ancient hub of Christianity in the region. Without a militia of their own, thousands found safe haven in Bakhdida, about 19 miles to the southeast. When Islamic State militants staged a lightning attack on June 10 on Mosul and took over the city, fresh waves of Christians fled to Bakhdida; only this time, militants stayed on their heels. In less than 48 hours, a flurry of mortar rounds and stories of kidnapping and murder of their co-religionists in Syria combined to empty the town. The Syrian Catholic Archbishop of Mosul, Yohannna Petros Mouche, was one of the few who stayed behind. He understood that many families had left “to lead dignified lives”, but he’s resolved not to go. “If we all leave, it sends the message that there is nowhere safe for Christians to live in Iraq — and this worries me,” he said, gripping the pewter cross that hung heavy from his neck. The seminary he overseas in Bakhdida had already become a way station for 35 Christian families and clergy from Mosul. According to Father Amanoel Adel Kalloo, one of the displaced, the city’s Christian community has plunged from about 3,000 to between 200 to 300 since the Islamic State takeover. On two trips back to the city to collect belongings, he saw that the homes of religious leaders had been ransacked and taken over by militants, he said. Muslims renting property from Christians have been ordered to pay the Islamic State instead, and employers have been told to lay off all Christian workers. For the first time in 1,600 years, there is no Sunday Mass. While lives have so far been spared, Kalloo said the early July disappearance of two women who ran an orphanage, along with three children under their care, has stoked anxieties. He believes the rebel group was behind the abduction, but no one has yet received any information on their condition or whereabouts. In Bakhdida, residents are grateful to Kurdish forces that have established a security perimeter around the city, allowing some breathing room for people to return. The Kurds have since outfitted a local Christian “protection committee” with bulletproof vests and assault rifles to patrol the streets. For now, the overwhelming concern is water. Area taps have run dry since Isil took Mosul and cut off the town’s Tigris River water supply amid 100-degree-plus temperatures. All water now has to be trucked in from outside at great expense. Adding to people’s woes are electricity blackouts for the better part of each day. The main hospital is short of doctors who have stopped coming from Mosul. And without funds to pay town employees, heaps of garbage are piling up along pavements that remain largely empty throughout the day. Bashar Toma, a 50-year-old mason, was among those preparing to leave. Last month, a pair of Islamic State mortars crashed onto the roof of the six-bedroom home Toma had painstakingly built to accommodate his children. He thanked God that no one was hurt. But the constant psychological stress of living less than three miles from an aggressive and well-armed rebel force — whose forward positions are visible from his roof — has become too much to bear for the lifelong resident. In the morning, Toma would move his family to a cramped apartment in Irbil.